The link between central Greenland stable oxygen isotopes, atmospheric blocking frequency and cold temperature extremes at decadal to multidecadal time scales is investigated using observed and proxy data as well as model experiments. A composite analysis reveals that positive stable isotope anomalies in central Greenland are associated with enhanced blocking activity in the Atlantic European region. Several indices of blocking activity in the Atlantic European region are higher correlated with central Greenland stable isotope time series than with the North Atlantic Oscillation indices both in observations and model simulation. Furthermore, the blocking frequency anomaly pattern associated with central Greenland stable isotope variability is similar to the blocking anomaly pattern associated with the Atlantic Multidecadal Oscillation. A composite analysis reveals that stable isotope variations in central Greenland are related to a large-scale pattern in the frequency of extreme low temperature events with significant positive anomalies over Europe and a southwest to northeast dipolar pattern over Asia. During observational period central Greenland isotope records, blocking and extreme temperature indices over Europe show enhanced variability 10–30 and 50–70 years. Similar quasi-periodicities dominate the spectrum of central Greenland isotope variability during the last millennium. We argue that long-term variations of climate extreme indices over Europe and Asia, as derived from observational data, can be put into a long-term perspective using central Greenland stable isotope ice core records. 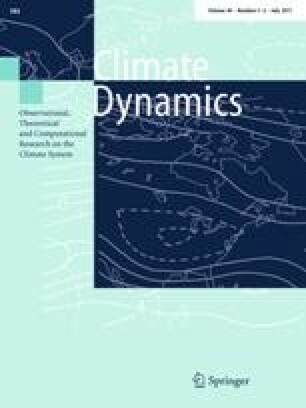 This study is promoted by Helmholtz funding through the Polar Regions and Coasts in the Changing Earth System (PACES) programme of the AWI. Funding by the Helmholtz Climate Initiative REKLIM is gratefully acknowledged. M. Ionita is funded through the OC3 Project—High- and low-latitude atmosphere–ocean interactions (Excellence Cluster “The Ocean in the Earth System”). We would like to acknowledge Dr. Martin Butzin for model data support and fruitful discussions. We thank the data contributors for making their data available to the public as well as the two anonymous reviewers for their constructive comments.